The injured included a man and a woman in their 20s. They were immediately rushed to the Intermountain Medical Center. 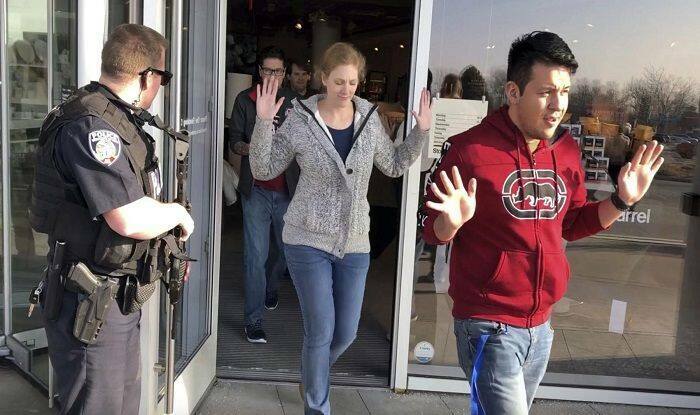 Shoppers raise hands at the mall in Utah where a gunman opened fire on January 13. Photo Credit: AP. Murray: A gunman reportedly opened fire at Fashion Place mall in the suburb of Salt Lake City in Utah, a state in the Western United States city. The shooting, which took place on Sunday afternoon, left two injured, stated authorities. Three people are wanted in the case. Officers are on the lookout for the suspects, stated a report by the Salt Lake Tribune newspaper. The identity of the suspects is unknown, though descriptions of them were available, stated a police officer. The suspects, who immediately escaped from the mall after the shooting, were wearing light-coloured hoodies or sweatshirts and dark pants, according to the Murray police. According to a report by Deseret News, Murray Fire Department officials informed about the two injured people, though they could not provide any more details at the moment. The shooting allegedly took place outside the mall’s east side. However, as per the witnesses of the incident and the video posted on social media, people were seen running inside the mall as they heard loud bangs. Murray is situated south of the Salt Lake City.